Critics have been increasingly disenchanted with Wes Anderson's films, but in Fantastic Mr. Fox, painstakingly slow stop-motion animation allowed him to create his signature storybook feel, while also allowing George Clooney and Meryl Streep to turn in lively performances. Fantastic Mr. Fox, which opens today, is the first animated film by Anderson, who is known for directing the quirky and distinctive films Rushmore and The Royal Tenenbaums. Critics weren't as fond of his most recent film The Darjeeling Limited because they felt Anderson was so preoccupied with the film's offbeat style that it stifled the actors. It was a risk for him to take on Roald Dahl's classic children's story because in addition to filming it in old-fashioned stop motion rather than CGI, he directed the film from Paris through a video link to London, where it was filmed. Anderson wrote the screenplay with Noah Baumbach (who also wrote The Squid and the Whale and The Life Aquatic With Steve Zissou). Mr. Fox (George Clooney) and Mrs. Fox (Meryl Streep) start out poaching chickens together, but when their son Ash (Jason Schwartzman) is born, she convinces him to take a more legitimate job. Twelve years later, he's writing a newspaper column no one reads, but when the family moves, he can't resist his wild urge to steal from his human neighbors. Three farmers led by Mr. Bean (Michael Gambon) wage war on the animal kingdom and Mr. Fox, along with his lawyer Badger (Bill Murray) and his sidekick Kylie (Wally Wolodarsky), have to outwit them. Though at times the plot is jumpy, critics uniformly praise the film, saying it "reanimates" Anderson's career. Though it seems odd to imagine George Clooney's very-recognizable voice coming out of a fox, several critics say he gives one of his best performances ever. The exquisite hand-crafted miniatures give the movie a depth that reviewers said many computer animated films (particularly Jim Carrey's A Christmas Carol) fail to capture. Below, the reviews. For the reportedly painstaking labor it took to create, the film is a marvel to behold-with wonderful shifts in perspective, an intensely tactile design, and an intentional herky-jerkiness of motion that only enriches the make-believe atmosphere. Clooney (speaking as if everything were a self-conscious aside) and Streep (resplendent as a former wildcat turned Earth mother) do some of the best work of their illustrious careers. Among the movie's many virtues, they render an unusually convincing portrait of a marriage, a reminder that the most unexpected thing about Anderson's film may be-underneath all the carefully affixed, wind-sensitive whiskers and fur-how deeply human it is. There should be something incongruous about the sound of George Clooney's cashmere-flannel voice coming from the mouth of a somewhat rangy-looking fox in a country gent's corduroy suit: Why should a matinee idol suffer the indignity of being trapped in a puppet's body? But from the first minute of the Wes Anderson stop-motion-animated feature Fantastic Mr. Fox, Clooney isthat creature, the genuinely fantastic Mr. Fox of the title, a rapscallion charmer who wears many hats: husband, father, newspaperman, chicken thief. It's one thing for an actor to feel comfortable in his own skin; it's another for him to feel completely at home in the body of a fake-fur and metal-armature vulpus vulpus. And yet Clooney's naturalism is of a piece with the joyous, marvelously detailed movie around him, adapted from Roald Dahl's novel with adventurousness and seemingly boundless love . I'm not a big fan of Anderson's work. What I now understand, though, is that in essence, he's alwaysbeen making cartoons; he just confused the issue by putting real live actors in them. Before, he twisted reality into a permanent ironic pose. Now, in the infectiously primitive talking-animal world of Fantastic Mr. Fox, he's become an ironic realist. The experience of Fantastic Mr. Fox... is like being magically shrunk down to 1:12 scale and set loose for 90 minutes in an exquisite, handcrafted, dizzyingly well-stocked dollhouse. If, like me, you're a lifelong aficionado of miniatures-someone who still presses their nose to toy-store windows filled with cunningly crafted furniture and tiny kitchen supplies-this movie will seduce you on tactile terms alone. The animal characters' real, shiny fur, gently moving in the wind! The infinitely detailed sets and props: acorn-patterned wallpaper, cutlery made from deer hooves, bespoke corduroy jackets with tiny stalks of wheat in place of pocket squares! You don't want to watch this movie, you want to climb inside it and play. There's no way the disparate elements of this movie should jell, yet here they sit, side by side, in the bric-a-brac of [Anderson's] brain. Frames in the foxes' den have a depth of field that evokes Velázquez paintings in the Prado. Then a bunch of characters dash down a tunnel to escape the farmers' bulldozers, looking in long shot like a child's plastic toy soldiers. A confrontation with an elongated hepcat security-guard rat (with the stabbing voice of Willem Dafoe) is scored and staged like a Sergio Leone spaghetti Western. Not even Quentin Tarantino would have the audacity to assemble a soundtrack in which the Beach Boys' "Heroes and Villains" is followed by Burl Ives, Mozart, Jarvis Cocker (as a farmhand) singing and picking a banjo, the Rolling Stones' "Street Fighting Man," and-believe it or not-"Ol' Man River." 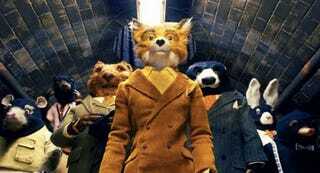 [Fanstastic Mr. Fox] reanimates filmmaker Wes Anderson's career... Not since the memorable days of Bottle Rocket and Rushmore has it made sense to apply those words to Anderson. Though the director never lost his hard-core fans, his work had gotten hermetic, even stifling. With Fantastic Mr. Fox he's managed to be himself and still let some air into the room. The screenplay sometimes overdoes the winking asides, and the film doesn't so much flow as jump from one set piece to the next. But with animation director Mark Gustafson, DP Tristan Oliver and production designer Nelson Lowry, Anderson has created a world as stylized and inventive as anything he's done. From the fox-red glow of a morning idyll to the noirish gutter scene where one character meets his end to the icy fluorescent glare of the film's closing scene — happy but not without compromise — Fox is a visual delight. At times this adaptation of Roald Dahl's slender anti-fable - truer to the spirit than to the letter of the source - does not even look like a movie. In spite of the pedigreed voices... it feels more like an extended episode of what progressive educators call imaginative play. The sets might just as well have been built out of available household stuff, the stiff figurines animated and ventriloquized on a classroom or bedroom floor by precocious children. Is it is a movie for children? This inevitable question depends on the assumption that children have uniform tastes and expectations. How can that be? And besides, the point of everything Mr. Anderson has ever done is that truth and beauty reside in the odd, the mismatched, the idiosyncratic. He makes that point in ways that are sometimes touching, sometimes annoying, but usually worth arguing about. Not everyone will like Fantastic Mr. Fox; and if everyone did, it would not be nearly as interesting as it is. There are some children - some people - who will embrace it with a special, strange intensity, as if it had been made for them alone.